← CHPWN Jailbreaks iPhone 5 On Day 1!!! The iPad Mini is here. It’s a sleek, thin and light 7.9-inch tablet made of anodized aluminum and glass that follows the format reduction pioneered by Google and Amazon. This thing is really neat. Really light and thin at 0.68 pounds and 7.2 millimeters. 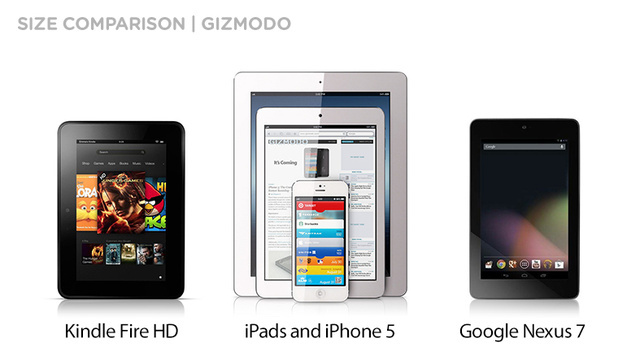 In a nutshell: it has better specs and it’s thinner and lighter than the Amazon Kindle Fire HD and the Google Nexus 7. In fact, the iPad mini’s screen has 35% more real estate than the Nexus 7. The pixel resolution is 1024 x 768 pixels. It’s not as dense as the iPad 3 and 4, but at that size it will be much sharper than the previous generations. One cool thing about the screen: it recognizes whether your thumb is resting on the display or actually using it. Clever. The iPad mini is an all anodized aluminum design, like the iPhone 5. The Google Nexus 7 is made of plastic, while the Kindle Fire HD has a rubberized back that is quite nice to grab. Like the iPhone too, it comes in black and white. It’s quite light and thin. It’s comparable to a pad of paper, like Apple says: just 0.68 pounds and 7.2 millimeters thin. That’s 53% lighter than the fourth-generation iPad. It compares very favorably to the Nexus 7 (0.75 pounds and 10.4 millimeters). Some models come with LTE connectivity, like the Kindle Fire HD 8.9-inch. But that’s much more expensive. The comparable regular Fire HD and the Nexus 7 only have Wi-Fi. It naturally comes with 802.11a/b/g/n Wi-Fi and Bluetooth (like Amazon and Google’s models). Like all the latest iOS products, it uses a Lightning port too. Basically, this is a reduced iPad 2. It uses the same dual-core A5 processor, and it probably comes with the same RAM as the old iPad: 512MB. Apple say it’s basically the same (or better) guts but in a reduced package (an exception is the cameras and the Lightning port). Both the Fire HD and the Nexus 7 come with 1GB of RAM. We will have to wait to learn how much RAM it has, though. Perhaps this has been upgraded too. Like all the iPads, it comes in 16GB, 32GB and 64GB flavors. Apple claims a 10 hour battery life surfing the web on Wi-Fi, watching video or listening to music, using its 16.3-watt-hour rechargeable lithium-polymer battery. The Nexus 7 is rated by Google at 8 hours. Amazon says that their Fire HD has 11 hours. It has a FaceTime HD camera, which is better than the one in the iPad 2. It’s comparable to the Nexus 7, which is 1.2 megapixels too. The iPad has a backside illuminated sensor and, like its older sibling, it supports Face detection. Like the bigger iPad, it comes with a 5 megapixel camera on the back. This is something that neither the Nexus 7 nor the Kindle Fire HD have. If you were hoping for a $250 starting point, brace yourself for disappointment. It starts at $329 for the Wi-Fi only version, with 16GB of storage. The 32GB and 64GB are $429 and $529. If you want the LTE connectivity, you will have to pay $130 more. The Kindle Fire HD and the Nexus 7 don’t have LTE support at any price point (if you want LTE on the Fire HD, you have to get the 8.9-inch model, which is the competition to the iPad 4 starting at $499 for the 32GB model). On the Wi-Fi front, however, both Android tablets have a much better price, specially the Fire HD, which is $199 for the 16GB model. The $199 Nexus 7 will only get you 8GB. You can start pre-order Friday, October 26, and receive the Wi-Fi version on Friday next week, November 2. The cellular versions will come first to the US, two weeks after that date. They will come later to the rest of the world (no announcement yet). This entry was posted in iPad and tagged apple, ipad, mini. Bookmark the permalink.